The Wife: After seeing several “serious” movies recently, sometimes a little stupidity and humor is necessary. Also, since there isn’t much to do on a Friday night in our town, the movie, Identity Thief, seemed like an appropriate choice. Not to mention, I typically enjoy Jason Bateman’s movies. I will first off say that this was everything I thought it would be: decently funny with a semi-entertaining, yet completely unrealistic plot. However, my movie experience as a whole was quite unpleasant due to a few select movie patrons. Regardless of the LOUD person, I tried to pay attention as best I could, even though at times I literally had to STRAIN my ears to hear what the characters were saying. Fortunately, Identity Thief isn’t a deep film, so that helped. The movie stars Bateman as Sandy and Melissa McCarthy, who I will always remember as Sookie from Gilmore Girls although she is best known for Bridesmaids, as Diana. Sandy is seen as a mild mannered family man and financially conservative type. Flash to Diana, who is wild, upbeat, and makes her living by scheming and stealing identities. Of course, she ends up stealing Sandy’s identity, which leads us to the plot of the movie (obviously). While the entire premise of how McCarthy’s character stole identities and how law enforcement dealt with the issue is highly unrealistic and inaccurate, it did make for some humorous hijinks. With his identity stolen and his new job on the line, Sandy decides that the only way to rectify the situation is to travel across the country, catch the person who stole his identity and bring them to the authorities. He easily catches Diana, which leads to a crazy road trip with the characters. In predictable fashion, Sandy and Diana seemingly bond during the road trip, however this of course comes with clashing personalities, oh and the fact that SHE IS A CRIMINAL. Haha! Of course, in true Hollywood fashion, the movie makes you end up feeling sorry for Diana’s character. I won’t spoil the ending for you, and while it was predictable, I enjoyed how they wrapped up the story. 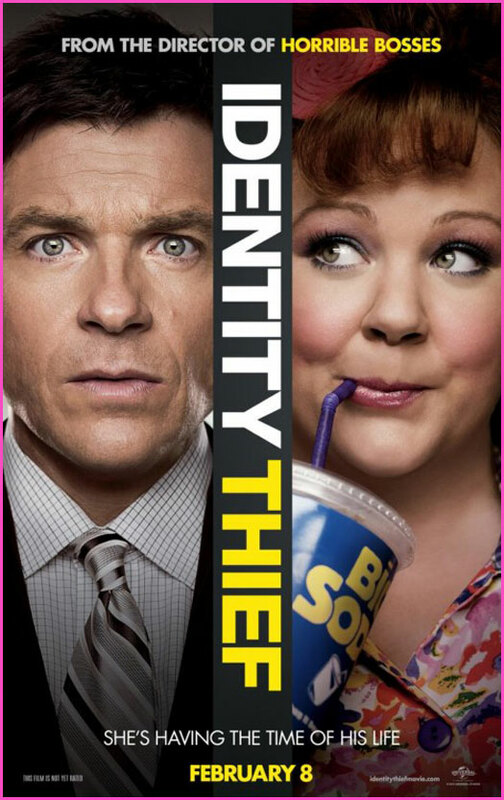 Taking the unrealistic aspect out of it, Identity Thief did deliver in the laugh factor. It was funnier than the previews made it out to be, which was a nice surprise. While I did like the movie and find it humorous, it really isn’t a memorable type of comedy, like The Hangover. Unless you are super bored and don’t have incessant talkers at your movie theatre, I’d save this one for Netflix. Hobo Dan: What can I say about Identity Thief? Stupid title. Identity Theft. There, fixed that for you over paid Hollywood writers. I was entertained by this film in the most rudimentary way possible. Meaning; when a man is kicked in the balls, I laugh. The enormous distraction sitting directly in front of me gyrating to the hip hop music; chortling at the simplistic slap stick humor; loudly protesting at the use of the ‘F’ word in a rated ‘R’ movie; taking up three seats when the rest of us were crammed in like the poorest upper-class passengers on the last life boat off the Titanic; didn’t, to put it mildly, help my enjoyment of this run of the mill comedy will a lower case ‘c’. There is predictable, like The Hangover 2, then there is a mile of crap, followed by another mile of eighty’s comedies that are just funny enough that we remember laughing at them even though we haven’t actually watched them in years, then you’ll find Identity Thief. It was rude and crude, and I like rude and crude, but it was presented in a way that just made it pathetic, like the fat guy who orders two Big Macs and a Diet Coke or Lance Armstrong. It seems like the writers wanted it to be some edgy modern reflection of our world were black and white morals are slowly greying together, but then, just after first draft was finished, the producer fired those writers and replaced them with his twelve year old ginger son who is obsessed with fart jokes. And there wasn't even a single fart joke! Fail movie, fail. Let’s Talk About The Oscars!